30 June 2018, 1400PHT. This morning, Joji and I celebrated our 39th year together as UnifiedBeings doing our purpose-of-existence in the context of 21st century realities in this planet. 39 years and she’s still my fantasy. And for the past 39 years, I’ve been allowed to hold her hands and kiss her lips. A day before our 39th wedding anniversary, we travelled from Davao City, Mindanao Island to Manila, Luzon Island after a few days of field work. We left Davao airport at 2300PHT (a flight that was supposed to leave at 2100PHT). We arrived in Manila at around 0100PHT the next morning. We were so tired. But we were reminded, “It’s all about attitude.” We had this ‘selfie’ at La Taza Coffee Shop in Manila, owned by Maria Theresa B. Alparas, Joji’s sister. 0130PHT. 30 June 2018. We have three adult children who incarnated the essence of our love-union and who extrapolated the possibilities of the various convergences of our being — beyond our imagination. And our 6-going-7 grandchildren seem to repeat the same processes exponentially. I’ve been working with this woman in the same office since 2006. Professional. Efficient. Effective. Smart. I’ve been living in the same house with her since 1979. Clean and orderly enough to be healthy and sane; dirty and messy enough to be carefree and happy. On top of all her creative characteristics, technical skills, and many other personal qualities that make her great on her own merits, she’s also very, very beautiful! We see places together. I get high by taking her photos. LifeSurfers. PeaceBuilders. FairTraders. BestFriends. GrandParents. DancePartners. VisionCasters. MissionWorkers. BusinessTeam. ThirtyNineYears. | CPLA Camp Conrado Balweg, Kalinga | June 2018 | Photo by AJ Moldez. 39 years together here on Planet Earth. And with all the new lovely discoveries I enjoy about the essence of her being, I’d choose to be with her for a couple more eternities — in a new, yet unknown, plane of Existence and Being. 01 July 2018, 1000PHT. Last night, Joji’s parental family had a public celebration of the life of Mrs. Aurora Francisco Bautista. She was born in 25 October 1935 and passed away last 27 June 2017. Joji’s mother had a colorful life on earth for 82 years. Her passing away was natural and peaceful. 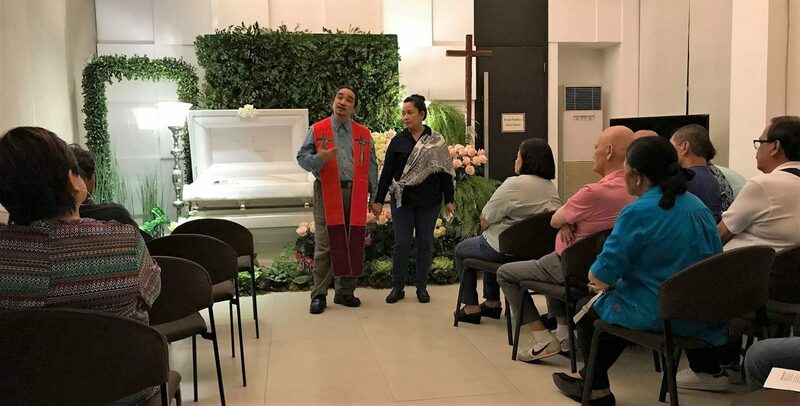 During the series of funeral services celebrating the life of Mrs. Aurora Francisco Bautista, Joji’s mother, we were asked by her father, Mr. Armando Salazar Bautista and the rest of the family, to help in the program. Hall C, Arlington Memorial Chapels, 12 G. Araneta Ave., Quezon City. At her funeral, I thanked God for the wisdom she showed me and Joji through her prayers, counsel, and ministry partnership. During the celebration of her life, Joji publicly affirmed the respect and the honour due her.